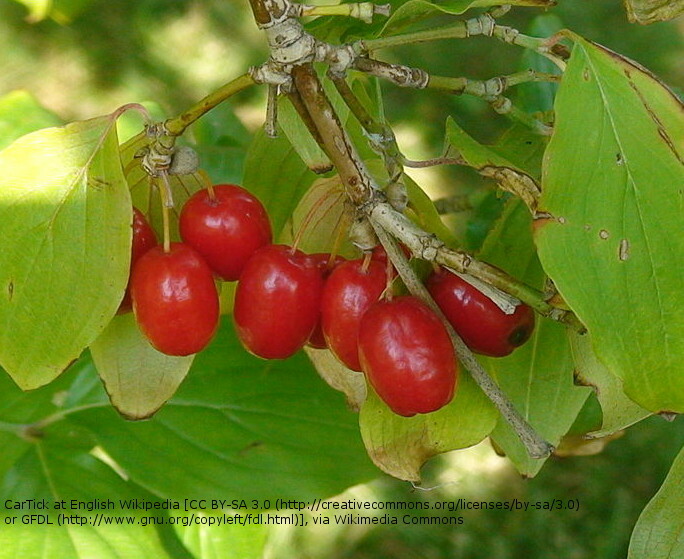 More commonly known as the cornelian cherry, Cornus mas is a medium-large deciduous tree of the dogwood family. Linnaeus referred to this species as both Cornus mas and Cornus mascula, translating to “male” cornel in order to distinguish it from the “female” cornel, Cornus sanguinea. It is native to South Europe as well as many parts of South Western Asia. 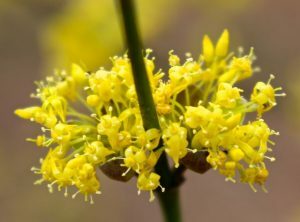 Cornus mas has a cold-hardiness rating of zone 4-8 allowing it to be successfully introduced to countries outside of its native range such as Norway, Denmark and Sweden as well as across the UK. Typically used as an ornamental plant, it is a bright and cheerful tree amongst the cold greys of winter. During autumn the glossy green leaves turn purple and come winter the tree boasts beautifully bright yellow flowers. The flowers appear around February to March and are typically very small (5-10mm in diameter) however they provide an important food source and a habitat for pollinators and other insects during those winter months.